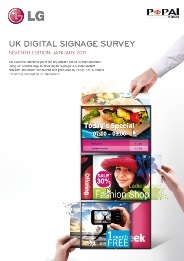 The seventh and latest edition of the UK Digital Signage Survey was published in February 2011. Commissioned by LG Electronics and conducted by POPAI, the survey polled UK retailers, brand owners, shopping centres and network operators. The aim of the survey was to identify key trends in digital signage networks for retail and how retailers and brands are currently using the technology. The final report also offers predictions for the future. Phil Day, Business Manager at POPAI, said: "This survey is the most accurate guage of retail digital signage in the UK currently available and it shows that the use of this media technology is on the increase and becoming more sophisticated." "Much has changed since the last survey was conducted in 2007 in terms of the economy and technology. Therefore, we broadened our scope to focus also on the types of screen being used and the latest technology developments." If you currently use digital signage, this may help you to review or plan your usage strategy and if you are considering using the medium for the first time, it will help you to understand how others are already doing so. (£295 + VAT to non-members).